We’re all going entrepreneurial mad. In the UK, a whopping 80 new companies were created per hour in the first half of last year (according to data from StartUp Britain). We’re told that one in five millennials plan to leave their day job to start their own business – if only they could pay off their student debt first. And LinkedIn is currently full of people taking the opportunity of redundancy to do their own thing. Chances are, you’re reading this because you’ve started to wonder whether this is a route you could go down yourself. Or maybe you have friends and family who are pitching their business ideas to you in the hope that running a business will bring them more control over their working lives and greater rewards for their efforts. Having left a corporate job 17 years ago and run my own business ever since, I can certainly vouch for the fact there are lots of advantages to working for yourself – tons of autonomy, flexibility, no boss to answer to, massive variety in the range of projects/people you collaborate with each week, the chance to really set your own tone on how things get done. With so many advantages, I sometimes wonder why people would want to be on the payroll for anyone else! But of course, as with anything, there are trade-offs to be made. And all of these upsides come with downsides that people moving out of long-term corporate careers to work for themselves, sometimes don’t anticipate. 1. Are you happy in your own company? Unless you plan to throw money at premises and staff from day 1, the reality is you could be spending a huge amount of time on your own. This can be a massive wake-up call if you do your best work bouncing ideas off other people throughout the day and have a strong sense of ‘belonging’. I know a number of self-employed people who work from home alone every day and only see the postman between the hours of 8 and 6. Is this something that is going to be good for you personally? 2. How confident are you at selling yourself? Once the honeymoon period is over and you’ve exhausted your existing network of contacts who may be happy to hear about your new product/service….you’re going to be out there on your own. Without the quality stamp of a global brand on your business card or the large marketing budget that goes with it. Are you confident you can open doors on your own? Can you talk about your product/service in a language your potential customers can understand? And most importantly, will you really enjoy this part of the job? In the short term at least, you won’t be able to afford a salesforce. You will be it. 3. Can you make the shift to being a ‘Jack of all trades’? If you’ve been in a large organisation for many years, you’re used to having certain things done for you. There will be a process for everything and lots of departments to delegate to. 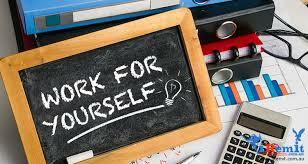 Working for yourself means initially you’ll be doing everything yourself as well. Are you really equipped for this? Do you have the versatility to move between admin tasks, business development calls, copywriting, purchasing stationery, fixing broadband all in the same day potentially? Cash flow is the life blood of a new business and things will quickly go pear shaped if you’re not administratively on top of your invoicing. Are you really willing to roll your sleeves up and go back to basics as required? 4. Are you able to create your own structure? There is a natural working rhythm to corporate life – the annual kick-off event, the planning meeting, the weekly numbers call, the monthly team meeting, the quarterly review, your annual appraisal. None of this will exist if you work for yourself. For some people, this lack of structure can be debilitating and lead to a massive drop in productivity as one week simply merges into the next. Are you a real ‘self-starter’? And by that I mean someone who can create and maintain a structure and rhythm to their work which enables them to get things done and stay motivated. Not someone who’s simply very effective at working within parameters that are already there. 5. Are you prepared for feast and famine? You may be going into this with the idea of a steady 3 days a week of paid work that creates a much better work-life balance for you and your family. This is definitely achievable but initially you’re quite likely to find yourself stuck between feast and famine. When it’s busy, you’ll be working all hours and too busy to take the time to enjoy it. When things go quiet, you’ll be worrying about where the next piece of work is coming from and not wanting to spend the money you’ve just earnt! How confident are you that you’ll be able to manage this situation calmly and see the picture of the whole year rather than get stuck in week to week anxiety? 6. How important is status to you? Sadly, we live in a society where a lot of focus is placed on what we do. You may have become accustomed to a certain level of acceptance and respect when you introduce yourself as ‘head of sales for a globally recognised brand’ and have probably got used to a certain lifestyle that goes with it. When you start working for yourself, you may feel that you lose a lot of the status that comes with a definable and recognisable big corporate job title. Are you really ready for this? 7. Are you able to let go of the security blanket? There are a lot of great perks that go with a corporate job that you sometimes don’t appreciate until you no longer have them – monthly salary, health insurance, paid compassionate leave, long term sick pay to name a few. Life still throws stuff at you whatever your choice of employment status. Are you in a position to walk away from some of these benefits or willing to provide them yourself moving forward? There are many people out there who work for themselves, find it hugely enjoyable and rewarding, and would never consider anything else. At the same time, this way of working is absolutely not for everyone. If you’re considering working for yourself in the near future, I hope this post has gone some way to helping you make a clear decision about whether this is a good option for you. Look out for my next post, where I’ll share the pitfalls to avoid in your first year.